It must be tough to moderate a panel when you are the smartest one on the podium. It's not yet happened to me but I imagine it must be agony knowing that the audience would rather listen to you. If you ever find yourself in such a position it is your duty to your audience to do something about it. Yesterday, I saw an innovative approach to such a situation at the Innovation Journalism conference at Stanford University. 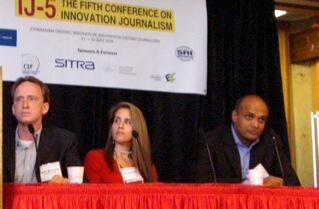 Faisal Rehman Malik, a TV anchor man from Pakistan, was the moderator for a panel on "Innovation in broadcast journalism for the 21st century." He spoke for 24 minutes out of a 30 minute slot about his new TV project and then asked his panel to ask him questions about it. Brilliantly innovative because as a moderator you can still include your panel for a few minutes while having spared your audience a tiresome 30 minutes. And what is Mr Malik's new TV project? It's a talk show about innovation. 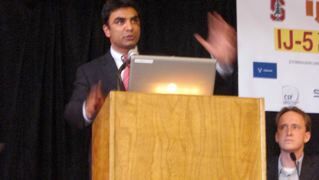 Afterwards, I asked Mr Malik if guests would be allowed to talk on his talk show. He said yes, they would. I said good luck with that. At the conference social mixer I had an interesting chat with one of his panelists, Cheryl Frank about innovation journalism, it's too bad the rest of the conference didn't get a chance to hear some of her insights. I think that in this crowded media world where it is so tough to keep up with so much information, it is good to know that you can rest easy when it comes to Mr Malik's new TV show. Next time you find yourself at the St. Regis Islamabad, tune into the News One TV channel and search out Mr Malik's program. You might be rewarded with a great talk show - otherwise, I find that monologues work far better than melatonin for the jet weary. Are startup media companies better at covering innovation than traditional newspapers and magazines? Moderator: Johan Anderberg - INJO Fellow '08 hosted by Fortune. Panelists: Anders Olofsson - Head of Digital Media; Sydsvenskan, Sweden; Thomas Frostberg - Editor-In-Chief, Rapidus News Agency, Sweden; Tom Foremski - Founder, Silicon Valley Watcher; G. Pascal Zachary - Journalist / Visiting Lecturer, Department of Communication, Stanford University.